Despite the heat and humidity, one plant seems to be impervious: Cleome, or spider flower. Even with very little rain this summer, it continues to shine…. I shot this at sunset, so was lucky to get some golden bokeh too. Hope your week’s going well…. 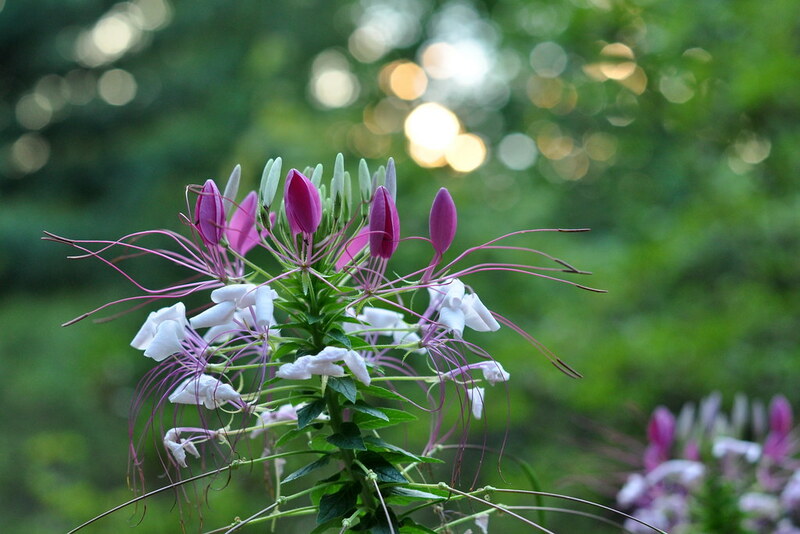 This entry was posted in photography and tagged bokeh, Cleome, spider flower. Bookmark the permalink. Just gorgeous….love the sparkle in the background! Great photo. Thanks! I lucked out with the sunset–we got there just as the sun was going. I have never seen this plant before, fascinating. The sparkle gives it something even more unexpected. They’re very easy to grow, but I’ve only seen them in the Southeast and maybe the South. I wasn’t really looking for them, though…. Lovely plant. I, too, have never heard of it. It looks like tiny dancing ballerinas. So good to see you here, Carolina! I think they look like dancers or little pixies too. so pretty . i cant take my eyes off of it! What a pretty little thing Cleome is! I’ve never seen anything like quite it. Perrenial? The heat wave up here lasted almost three weeks, but it doesn’t sound nearly as severe as what you’ve been experiencing. Hope you feel cool breezes and normal temperatures soon, Carole. At first I thought it was an annual, but it keeps coming up in the exact same places, so it’s a perennial. We’re finally having a gorgeous day here, Cheryl. Actually got to eat breakfast outside! I’ve never seen this flower. So pretty. I’m hearing that a lot. I guess it’s been overlooked or maybe went out of style for a while. That happens with plants. I’ve never seen this plant before. And once again, the colors are so restful for the eyes.